Mr. 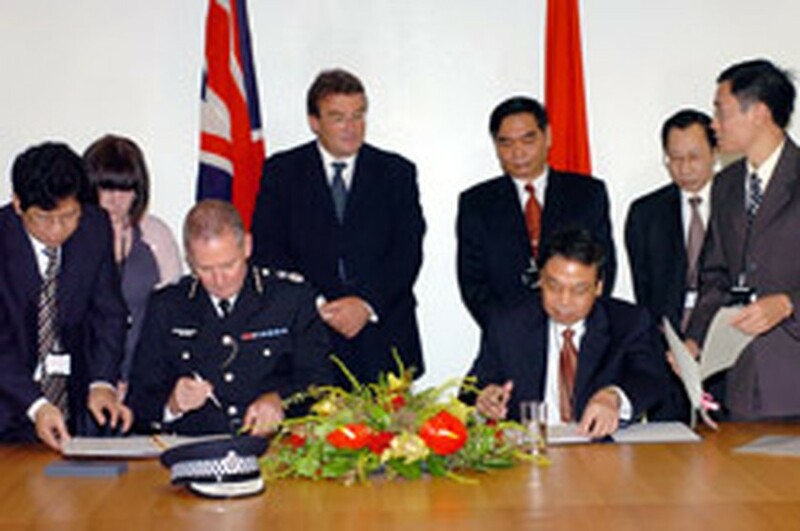 Le Hong Anh and Mr. Tony McNulty witness the signing ceremony of the memorandum of understanding (MoU) on cooperation in London, Sept. 4, 2006. Vietnamese police force and its UK counterparts have signed a memorandum of understanding (MoU) on cooperation during a UK visit by a senior delegation of the Vietnamese Public Security Ministry led by Minister Le Hong Anh. The memorandum creates chances for two side to closely cooperate in fighting against internationa organized crimes, share information and exchange experience. During the visit from Sept. 1-4, Vietnamese police officers visited police units under the UK Home Department and the Serious Organised Crime Agency (SOCA). They had working sessions with Secretary of State for International Department Hilary Benn and Deputy Secretary of State for Home Department Tony McNulty. The two sides exchanged views on issues relating to criminal fighting, public security and protection of citizens.